Body: Overall restoration and paint by IAG Performance with Glasurit paint products. Candy blue carbon fiber hood, trunk with Mines rear lip spoiler and HKS Kansai rear diffuser. Custom one off carbon fiber one piece front bumper. 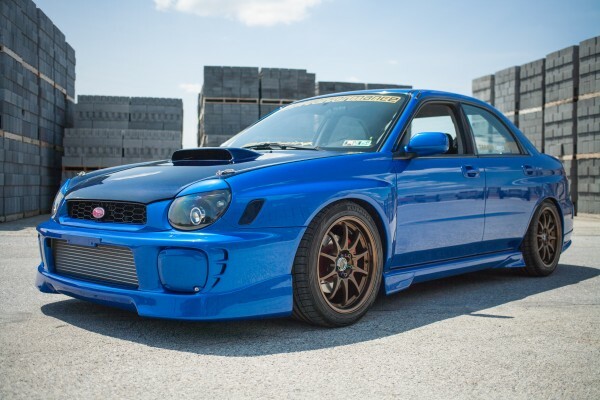 Suspension and Wheels: Coil over suspension provided by BC Racing, CE28N Volk Racing Wheels by Rays and Subaru Spec C brakes. Engine: Stage 4 plus, 18G turbo, JUN valve train and cams, APS DR500 Front Mount Intercooler, HKS Headers, Prototype Greddy Turbo back exhaust tuning provided by Cobb Tuning. Interior: Takata Drift 3 Harnesses, Takata Street Pro LE Seats, gauges provided by Autometer, Carbon Fiber rear seat deletes by RallyTech UK.